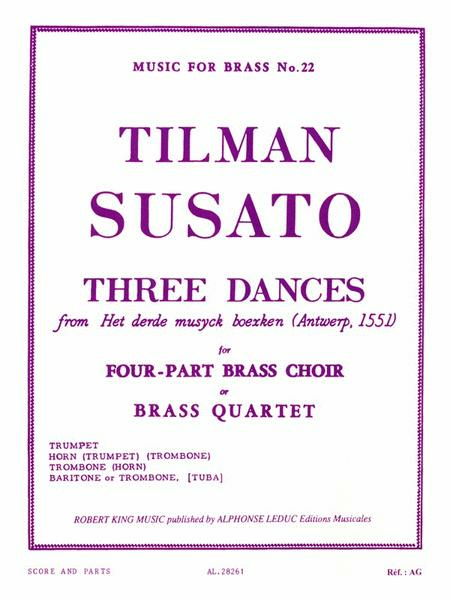 “Tilman Susato (1515-1570) was primarily known for owning a publishing house in Antwerp during the Renaissance era. However, he was also an established composer and his Three Dances from Het derde musyck boexken prove his accomplishment. 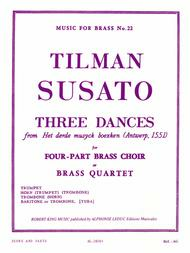 Much of Susato's compositions are adaptable to many arrangements, with this score being no exception. The Three Dances, Ronde, Salterelle and Pavane, adapted for a Four-Part Brass Ensemble by renowned brass arranger, Robert King, is an exciting piece for aspiring brass players. With separate parts, this edition is essential to the brass player's ensemble repertoire.”.